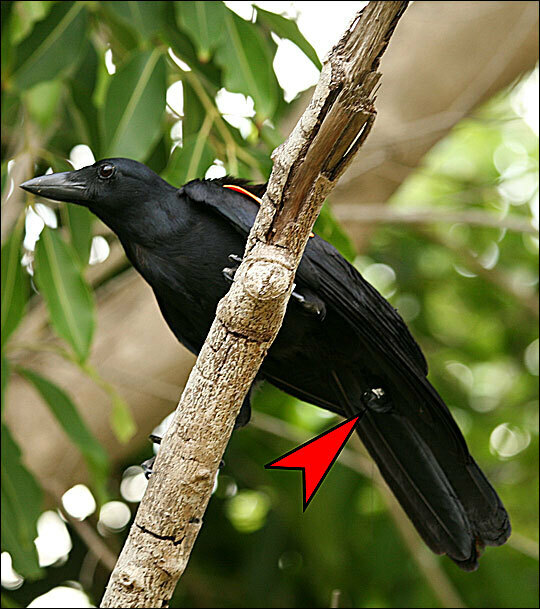 Crow Cam Captures Creative Behavior in the Wild Tiny cameras taped to the tail feathers of wild crows are giving scientists a new perspective on the bird's behavior. Researchers have been able to observe the birds using tools as they forage. This wild New Caledonian crow has been tagged with a video camera. 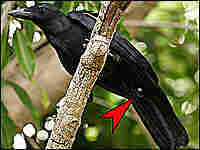 The red arrow points to camera lens protruding through the tail feathers. 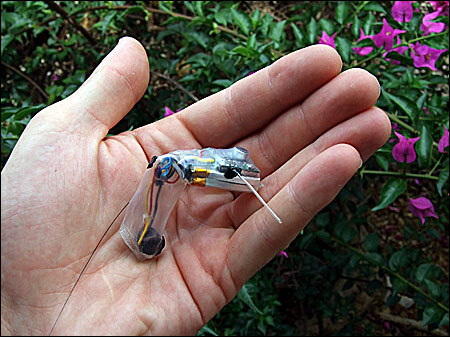 The video-camera units attached to the wild New Caledonian crows weigh less than half an ounce. A few years ago, scientists were astonished when they saw a crow named Betty invent a new tool. She took a straight piece of wire, bent it into a hook, and used the hook to get food out of a tube. But this was a captive crow that lived in a lab. What researchers really want to know is how wild crows make and use tools. So, to find out, they trapped wild birds on a tropical island and attached video cameras to them. The footage from this Crow Cam is not the most beautifully produced nature documentary, but keep in mind, it was shot by wild birds. One scene is labeled "4:21 pm. Flight." You see a tree branch and black crow legs. Then the bird takes off. The shaky video shows blurry trees far below, bright sky, and black flashes of wing. You hear wind and cawing. Christian Rutz at the University of Oxford is a member of the group that conducted the Crow Cam research. "Most people struggle to understand what's going on because it's a very unusual perspective," Rutz says. "Everybody would expect the camera to sit on the head. Or possibly on the belly or the back." But his group found that wouldn't work. So they taped the tiny cameras to the birds' tail feathers. The camera comes down through the feathers and then points forward. The view is like what a quarterback might see as he looks through the legs of the center who is holding the football. Rutz admits that the odd perspective takes some getting used to. "To have this view where you see a look through the bird's legs is very unusual," he says. But Rutz knew the weird view could still be very revealing. He and his colleagues went to the tropical islands of New Caledonia, near Australia. They caught 18 wild crows and attached the cameras, which weigh less than half an ounce. A timer kept the cameras from filming for a couple days, otherwise they would just record crows trying to tear them off. When the cameras came on, the team set up a receiver and watched the crow channel. "We see the live footage coming in on this little camera, so we are live and in color on the wing with the New Caledonian crow," Rutz says. In the online edition of the journal Science, the research team says it got about seven hours of video. The team saw two male crows using sticks and dry blades of grass to probe around on the ground. The birds held the tools in their beaks and even carried them from place to place, suggesting they might hold on to especially "good" tools. Kevin McGowan is a crow researcher at the Cornell Laboratory of Ornithology in Ithaca, N.Y. He says wild birds can be hard to observe, especially in forests. "This is actually pretty cool," McGowan says. "To be able to watch the bird handling a tool, to know if it was on the ground or flying around, that's a rare insight into the lives of birds that we just normally only can imagine." McGowan says he has never heard of cameras being used on flying wild birds before. Neither has Greg Marshall at the National Geographic Society in Washington, D.C., which has a new exhibit on his Crittercam. Twenty years ago, Marshall pioneered the idea of putting cameras on animals, starting out with a sea turtle in Belize. "Since then, we've worked with somewhere on the order of 60 different species," Marshall says. Crittercam has mostly been used on big marine creatures such as sharks, whales and seals. Marshall says the new work on crows just shows what can happen as cameras get smaller and smaller. "The fact that they've found a viable research question with a bird that small is remarkable and fantastic," Marshall says. "And they've done a great job sort of extending that frontier." Next week, Marshall is holding the first conference for researchers who attach cameras to wild animals. He says that about 200 people will attend, including Christian Rutz, the crow guy.